Last week on a phone call from Pollock, South Dakota my wife asked how things were going with our first trip to the prairie. 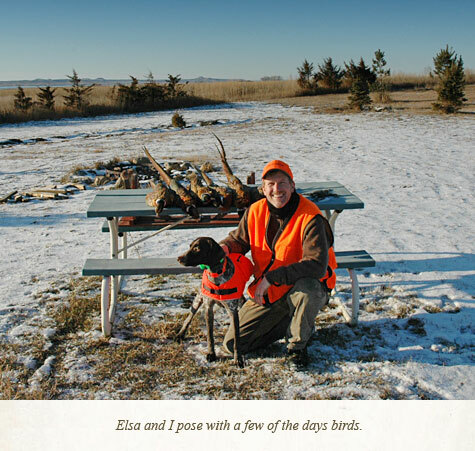 I answered with the following: first, I’ve never seen so many pheasants and second, Elsa and I are way out of our league. 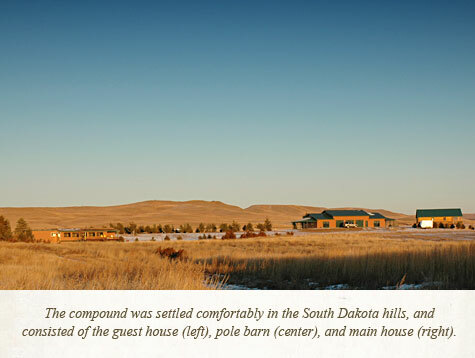 We stayed at the hunting home of a business colleague, which was situated near the banks of Lake Oaheabout a mile south of the North Dakota border. Their immediate property consisted of a compound of sorts with a main house, stocked guesthouse and a large heated pole barn, dubbed the “Garage Mahal”. This building was complete with a state-of-the-art game cleaning station. South Dakota had an extremely warm November, which abruptly came to a halt the moment I showed up. On December 3rd, the weather was in the upper teens with 10 to 20 mph winds, and light snow. The terrain was a mixture of grassy fields, rolling hills, bluffs, and steep ravines. 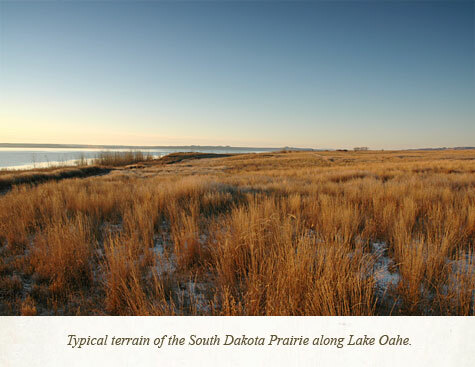 Foliage consisted of prairie grasses, corn stubble, juniper, evergreens and a few patches of hardwoods. The land on which we hunted was over one thousand acres! At times, the sheer vastness of the land was overwhelming. This added up to some challenging conditions for a second-season upland hunter and a two-year old GSP. During the first afternoon, we drove along State Line Road (on the border of North and South Dakota.) As we drove along, to my amazement numerous groups of pheasants flushed out of the cornfields on the north side, across the road and into fields on the south side. At one point, we spotted a covey of about 25 Sharp-tailed Grouse (which lifted off moments later.) According to folks from this area, the numbers are very low compared to the last season, but to us out-of-staters, it seemed like an enormous volume of birds. I released Elsa, who found herself challenged with holding down birds due to the high volume of scent and skittishness of the pheasants. Her quartering work reflected this through a number of rapid left/right turns, sudden 180s, and a handful of false points. During the morning on day two, Elsa and I were working our way along the shore of the Missouri River when I spotted a number of Sharp-tails flushing ahead of us. One flushed late, I dropped it and Elsa followed with an impressive retrieve-to-hand along the beach. It made for a memorable “first grouse” moment. By the afternoon our party of three hunters agreed that it seemed as if the “dumb birds” were harvested earlier in the season and we were left with the tougher, smarter birds. As we walked through the terrain, birds were consistently flushing about 60-70 yards ahead of us. If not flushing early, they were frequently spotted running. Later in the afternoon I hit three pheasants, watched them drop, hit the ground and run away. Yup, these late season birds are pretty tough. Day three started off with the same chilly temps (7F), but with sunny skies and a light breeze. Elsa and I went out on our own, hunting to the north of the lodge. In the first hour she pointed and held two hens, which are illegal to shoot. In the afternoon, things improved with another Sharp-tailed Grouse and two pheasants. By the third day, I watched Elsa refine on her points, finding a strategy and improving in terms of handling running birds. For example, as we worked our way through a row of juniper, Elsa got “birdie”, her tail took on a life of it’s own, and dropping low she rapidly crept forward, hesitating every few moments. I followed her until suddenly a rooster jumped to our right… this resulted in a nice retrieve, her ultimate reward. She also held a point on a hen about 100 yards ahead of me for several minutes. Thankfully, she was wearing a hunter-orange vest, or I may have missed it. As I mentioned in a previous post, I did not know what to expect with a first upland hunt in South Dakota. We found ourselves in a vastly different environment hunting extremely wary birds. The trip turned out to be a serious learning opportunity for the both of us… and we managed to have some fun too. While our numbers weren’t high, the opportunity and experience was priceless.